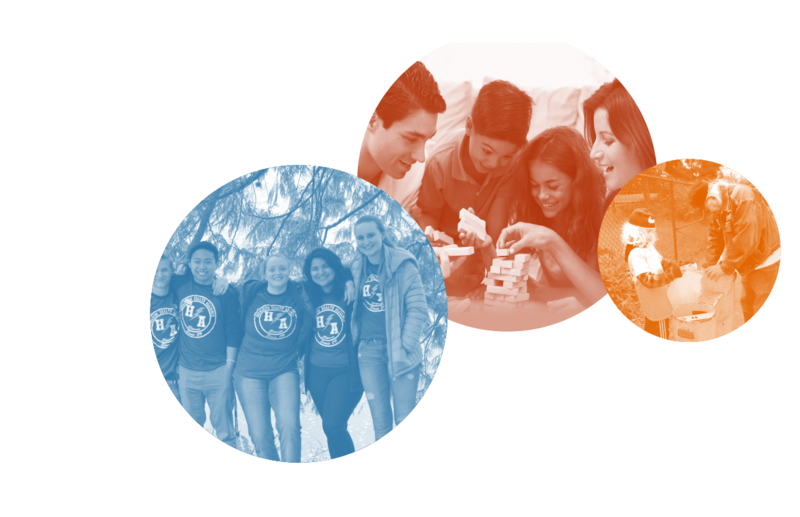 We collaborate to build the organizational and community capacity necessary to ensure all children, youth, and families have the skills and opportunities they need to lead healthy, productive lives. Learn about WPC and the healthy youth development we’re doing. A complete set of articles can be found here. M.A.D.-H.O.P.E. 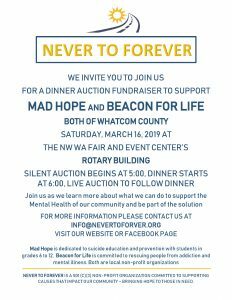 youth suicide prevention program was selected by the fundraising non-profit, “Never to Forever” as a co-recipient of the proceeds raised at their annual dinner & auction fundraiser. 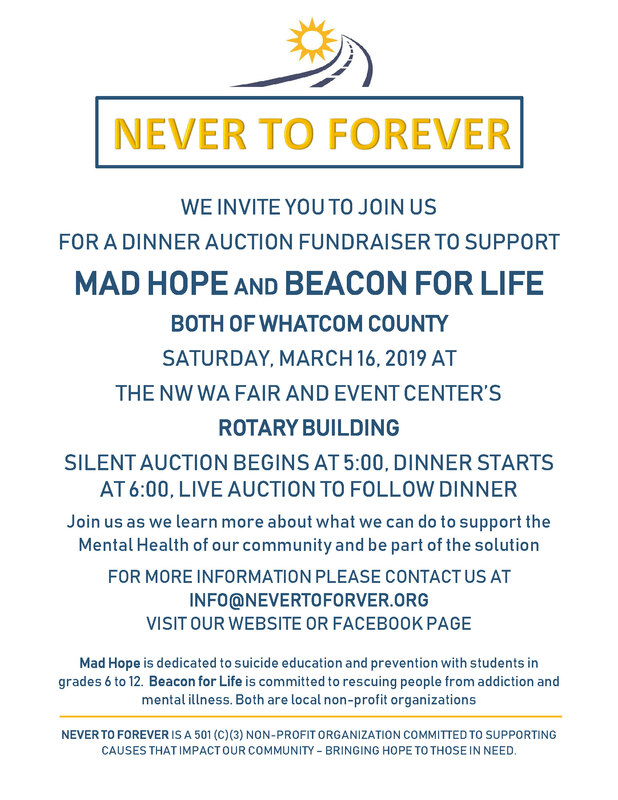 Join us for a Dinner Auction to support M.A.D.H.O.P.E and BEACON FOR LIFE On March 16th, 2019, at the Rotary Building at the Northwest Washington Fairgrounds in Lynden. There we will dine on a fine meal of Prime Rib or Salmon, we will enjoy community fellowship, and we will learn what we can do to be a part of the solution for those in need of help. Please consider attending this heartfelt event on March 16 to support M.A.D.-H.O.P.E! See details below and visit Never to Forever’s website at https://nevertoforever.org/events for more information and to RSVP. Thank you for your support! M.A.D.-H.O.P.E. is dedicated to youth suicide education and prevention with students in grades 6 to 12. Adolescence is the age of opportunity. Plenty of healthy and unhealthy risk taking options present themselves. 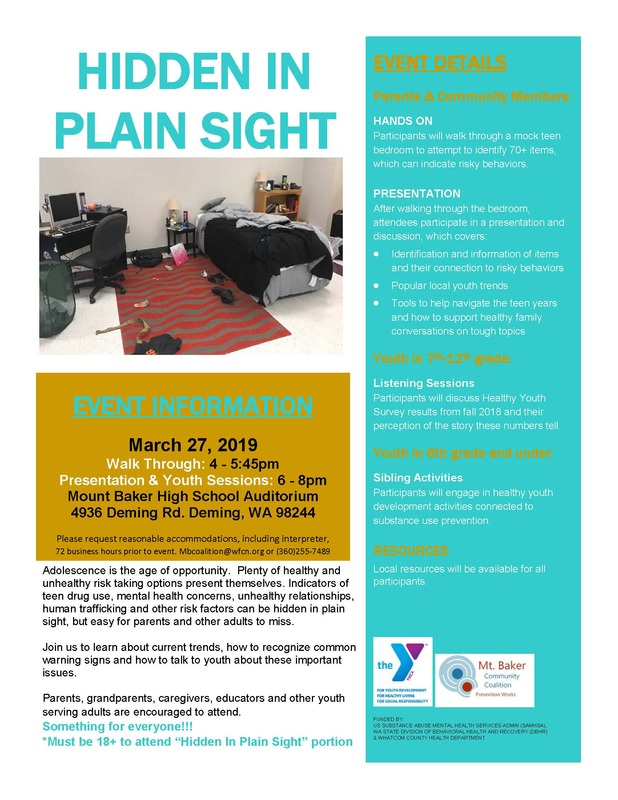 Indicators of teen drug use, mental health concerns, unhealthy relationships, human trafficking and other risk factors can be hidden in plain sight, but easy for parents and other adults to miss. Join us to learn about current trends, how to recognize common warning signs and how to talk to youth about these important issues. Parents, grandparents, caregivers, educators and other youth serving adults are encouraged to attend. Participants will walk through a mock teen bedroom to attempt to identify 70+ items, which can indicate risky behaviors. Participants will discuss Healthy Youth Survey results from fall 2018 and their perception of the story these numbers tell. Participants will engage in healthy youth development activities connected to substance use prevention. Local resources will be available for all participants. 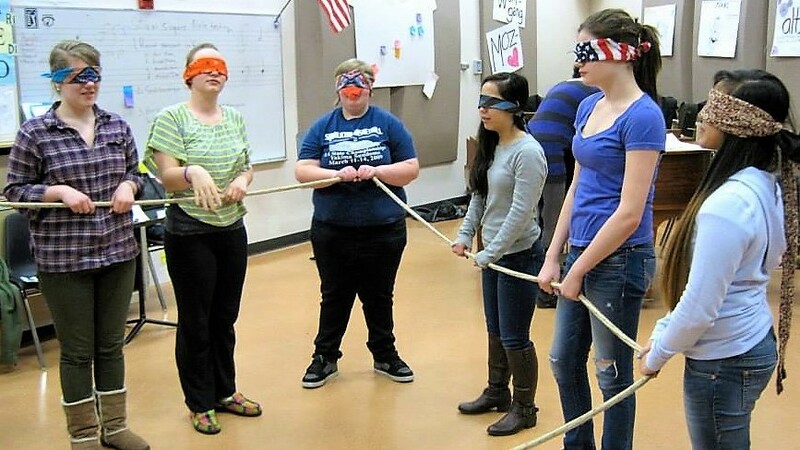 To empower adults and protect children, we partner Brigid Collins and Darkness to Light to provide the nationally recognized, Stewards of Children training. 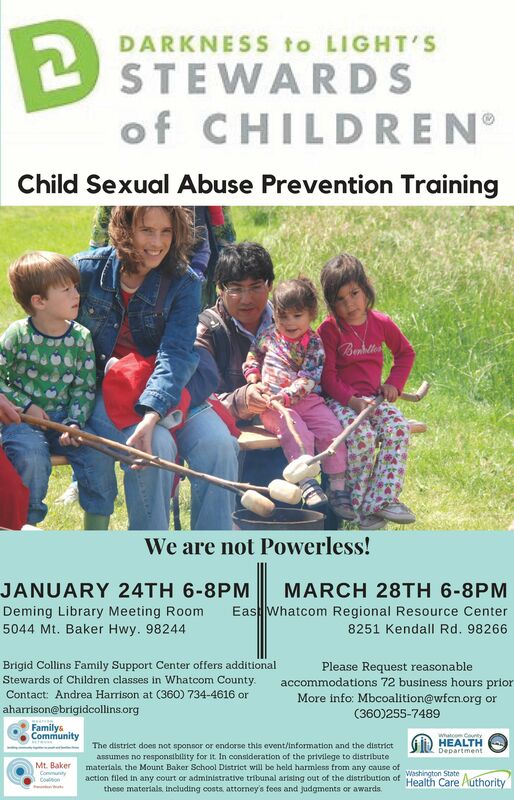 This revolutionary program educates adults to recognize and react responsibly to child sexual abuse. It is the only child abuse prevention program shown to increase awareness of child sexual abuse, improve attitudes about adult responsibility and increase protective behaviors. Trainings are offered to the public each month, and unless otherwise indicated, begin at 5:30pm and last two hours. Typically, there is a $10 fee to attend to cover the cost of materials, but that fee is being covered by Mount Baker Community Coalition. Please email mbcoalition@wfcn.org to register. 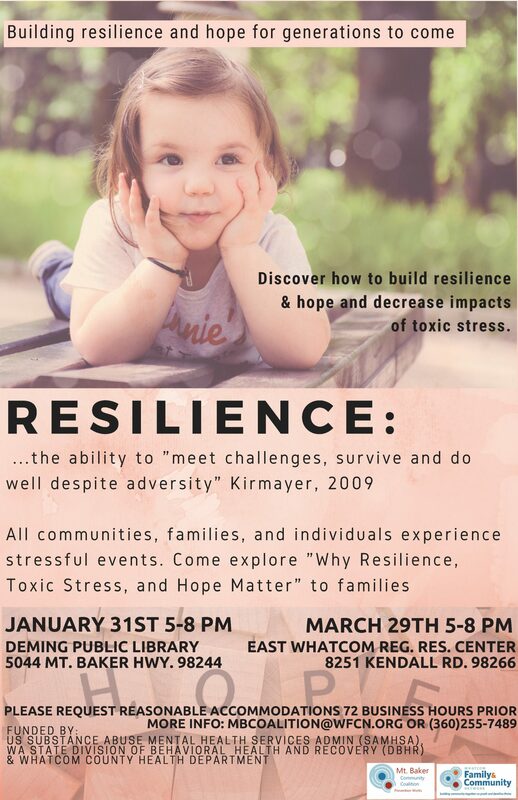 Mount Baker Community Coalition (MBCC) a program of Whatcom Family & Community Network (WFCN) hosts this 3-hour training on ACEs research and the power of resilience to mitigate the effects of early trauma. Typically, there is a fee to attend, but that fee is being covered by Mount Baker Community Coalition. Please email mbcoalition@wfcn.org to register. ADA accommodation requests must be received at least 72 business hours in advance. This training is geared towards parents, caregivers, and families. 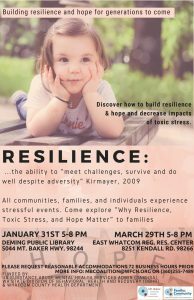 Come explore why resilience, toxic stress and hope matter to families. Participants will engage in discussion and leave with an understanding of resilience, toxic stress and the science of hope. You will learn more about protective factors that are already in place and how to put more in place for the children and youth in your lives. Participants will learn about the progressive nature of adversity and about promoting resilience and creating transformative and sustainable change to build a stronger family and community. 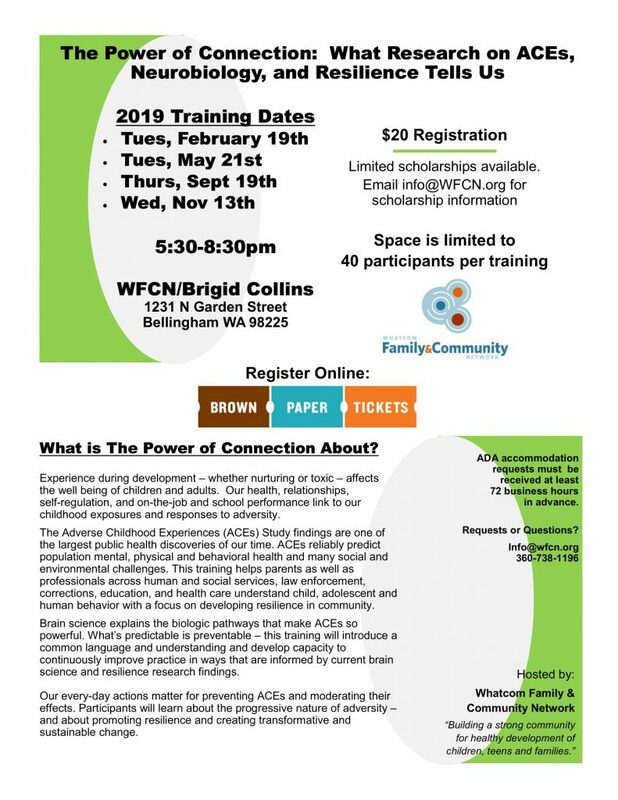 If you have questions about upcoming meetings or would like to be added to the Whatcom Prevention Coalition email list, please contact Lisa Moulds at LisaMoulds@WFCN.org. Brown Paper Tickets Ticket Widget Loading... Click Here to visit the Brown Paper Tickets event page. Our mission is to build the capacity of communities and organizations in Whatcom County to support children, youth, and families so that they can develop the skills and opportunities they need to lead healthy, productive lives.